Correa in line to start in Baltimore? Ryan Mink of BaltimoreRavens.com reports that inside linebacker Kamalei Correa sees a night and day change for himself from his rookie year, giving him the edge in the competition to start next to C.J. Mosley at inside linebacker. 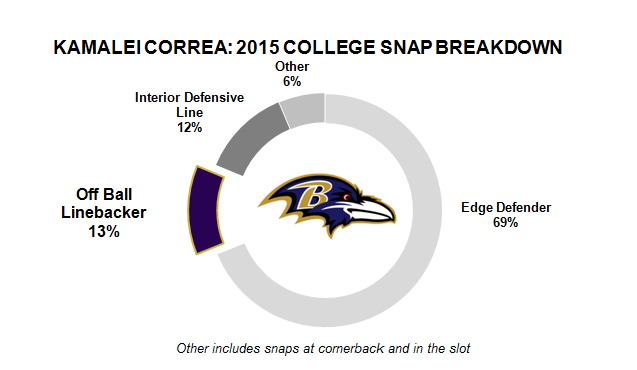 Correa played just 49 snaps on defense in his rookie year, but 41 of those snaps came as an edge defender. In preseason he split time between inside and outside linebacker, with 45 snaps on the inside, and 43 on the edge. The transition to inside linebacker will be interesting to see, with Correa at his best in college as a pass rusher, with 20 sacks, 23 hits and 38 hurries between 2014 and 2015 and Boise State.